The Phoenix Cinema in East Finchley has become my new local and a couple of weeks back, I read that there were free guided tours on offer so I popped along to take a peek behind the scenes. The cinema opened 100 years ago in May 1912 when the films were silent, the audiences less so and the live music swelled from the orchestra pit. 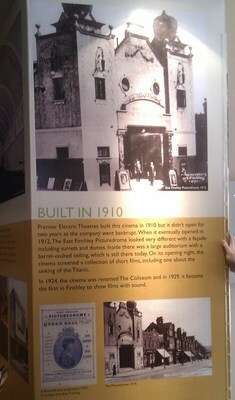 Known as the East Finchley Picturedome, its first screening was a film about the Titanic - which had recently sunk. The original auditorium faced the High Road and the builders had made use of the sloping land on the site so that all of the film-goers would be able to see the screen. In 1938, the building was remodelled and modernised to compete with the advent of rapidly expanding cinema chains and the auditorium was reversed to face in the opposite direction. 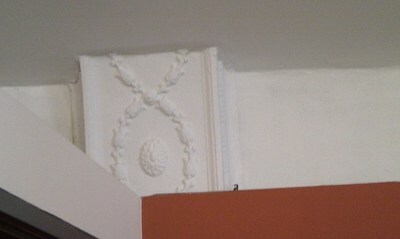 The original ceiling was preserved and there is still evidence of the old room's dimensions just outside the current auditorium entrance. 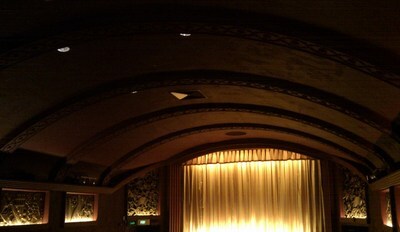 The auditorium captured (and still does) the grandeur and excitement of an outing at the pictures. The gold curtain swishes grandly in front of the screen and the art deco panels along the auditorium walls add a little 1940s flavour. With the arrival of television, in the 1970s the Rex (as it was now known) was struggling to draw audiences but 23 year old manager Stephen Wischhusen had an idea - to screen arthouse cinema. 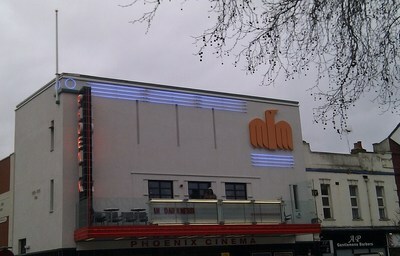 While this did not address the declining audiences, Steve's move attracted the attention of Charles and Kitty Cooper of Contemporary Films who purchased the cinema in 1975 and renamed it The Phoenix. 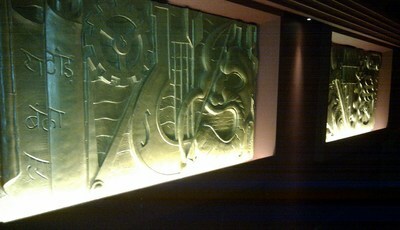 Surprise - Extra art deco panels discovered when the cinema was remodelled. In the 1980s, the cinema continued to lose money and in 1984, a local property company applied for permission to build an office block on the site. However, outraged locals were having none of it and gathered more than 6,000 signatures on a petition to stop the plans. Armed with this community backing, Charles Cooper worked with the Greater London Council on a way to save the cinema, resulting in a grant from the GLC to allow the newly formed The Phoenix Cinema Trust to purchase it from Contemporary at the end of 1985. 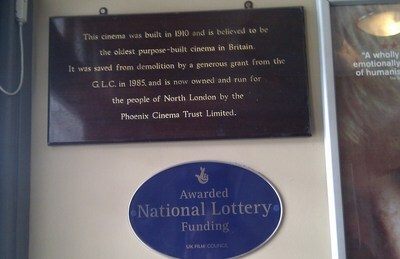 So The Phoenix is a community cinema in every sense of the word, run by the community for the community ever since. There are a great variety of films on offer as well as educational programs, free screenings, a great litte cafe and guided tours run by local volunteers. 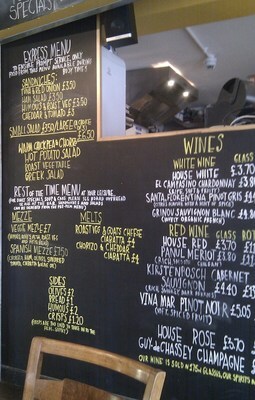 Fancy a bite before the show? Our guide took us through the story of The Phoenix, including her own personal experiences of it growing up and her admiration for the Coopers' passion and commitment to arthouse cinema in this tiny corner of North London. 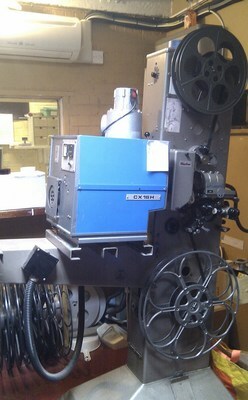 as well as the traditional 35mm projector. 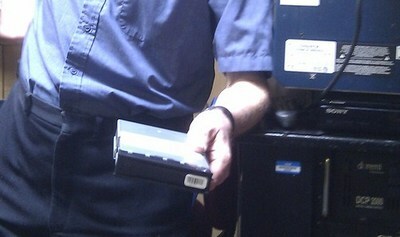 The clacketty clack of the film running through the projector was deemed to be music to the ear by projectionist Paul. The 35mm projector still in use - did you know there are movies you can only get on 35mm film? You'll find The Phoenix on the High Road in East Finchley just a short walk up the hill from East Finchley tube station. The programs are many and varied but be warned, films do not 'run' for long so if you see something you like, the best thing is to book it before it's gone again. And don't forget you leave enough time to treat yourself to a cuppa (or a glass of wine if you prefer) before the show. I'm off to see a From The Archives screening of Singin' in the Rain tomorrow, part of a program to celebrate 100 years of The Phoenix and just like every time I go, I can't wait for the swishy gold curtain to draw aside and immerse me in the magic of the movies.